Personally, I think there are way more important things for our nation to get worked up about than the caustic, impromptu utterances of TV celebrities and media conglomerate PR executives. But the fury that has erupted over the words of Duck Dynasty’s Phil Robertson and the tweets of IAC’s former public relations representative Justine Sacco should give us pause. They will arrive at that judgment quickly, and it will not likely be a charitable or forgiving judgment. Of course, most of us are nobodies from nowhere and are unlikely to arouse the ire of millions like Phil and Justine. Then again, who had ever heard of Justine Sacco before her fateful pre-flight tweet? The point is, people will judge you according to what you say, and the more shocking the comment, the more likely it is to spread and produce outrage. It seems unfair to make snap judgments about people we don’t know based on a single quote, but our words do reveal our hearts, after all. Both Phil and Justine were, at best, crude in their communication. It’s very possible that in both cases they were at least partially victims of their own inarticulateness. Let’s avoid this by becoming masters of words. It can be dangerous to miscommunicate when addressing controversial topics. It’s so easy to let our immediate thoughts and knee-jerk reactions spew out via keyboards and keypads. And in a world of rapid texting and digital communication, it seems easy enough to edit, hide, or delete words we later regret. But Justine Sacco learned the hard way that this isn’t always possible. She published her fateful tweet just before boarding a WiFi-less plane, and by the time she landed, her tweet had gone viral, her career was over, and her public persona irreparably damaged. Let’s be sure our kids know that anything they publish, post, or tweet can be captured, copied, and communicated infinitely. Even Snapchat images, which are supposed to disappear within seconds, can be immortalized easily on any smartphone. It’s one thing to say something regrettable. Spoken words can fade and be forgotten. Not so our spoutings on social media. Most folks are getting the idea that neither of these controversies are matters of freedom of speech. They have occurred precisely because of our country’s freedom of speech policy. No one is suggesting that laws be passed or that anyone should be censored by public officials. In both Phil’s and Justine’s cases, the consequence for their speech came via their employers — private companies with every right to dismiss someone for expressing ideas they deem offensive. If we feel strongly that these employers acted inappropriately, it is our right to stop doing business with them and express our opinions as we see fit. What we must teach our children is that being free to say what we think is not the same as being free from the consequences of what we speak. There are those who will want to suppress or punish me for believing things they don’t agree with. Depending on the social group I offend, they can be very effective in doing so. That doesn’t mean we should never speak our minds publicly. Certainly there will be times when this is the right and necessary thing to do. But we must do so with the full awareness of the potential consequences. Are we counting the cost before we speak? Are we teaching our kids to do so? Generally speaking, we’d all do well to listen to Grandma. Let’s be quick to commend and praise and a whole lot slower to condemn and criticize. Some things may be true, but better left unsaid. It’s not likely anyone is going to lose their job for being kind and gracious in their texting and tweeting. Because of all of the above, I’m not interested in expressing my opinions on Phil Robertson’s comments, A & E’s response, Justine Sacco’s comments or the actions of her former employers. I’ve certainly got nothing to say about it that hasn’t already been said. I’ll just take note and learn some lessons for me and my family. Please be free to leave any comment in the reply space below. Please make sure you have read this post carefully before you do so, however! Wonderful article – wanted to know if I could have permission to use it with my classes this fall in our introduction to digital citizenship? Thanks!! Permission granted. Thank you for the compliment. Insightful analysis, Brian, as always. I appreciate this article you have written. As always, you express your topic eloquently. The specific traits / personalities of the people you mention aren’t important, it is how one deals with the lessons to be learnt. They go together in that they both made public statements that expressed controversial opinions and got fired from prominent jobs over it. I didn’t mean to suggest that what the Duck Commander did was wrong (or right), only that we shouldn’t be surprised when our publicly-aired opinions bring consequences. Perhaps he wasn’t surprised at all. In that case–good for him. Maybe he weighed the risks and said what he said anyway. Agree or disagree with his position, I can respect that. Chad, thanks for sharing your perspective. This blog focuses on writing, grammar, and words. As I made clear in the blog post, I’d prefer to keep my opinion on the statements of these two public figures and their consequences to myself (or for other contexts). Both Robertson and Sacco presented opinions on issues volatile in our current culture. Why they are volatile is not the concern of this blog. The jury is still out, but it’s becoming clearer that Phil came out of this a winner. Cracker Barrel pulled Duck Dynasty merchandise, then put it back. 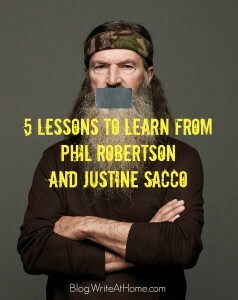 HuffPo reported that Phil will be in Duck Dynasty episodes in mid January. (He was never actually suspended at all.) Ratings will go up. Merchandise sales will go up. The perception will be that Phil took an anti-homosexual stance and won big time. All of this is because of his choice of words. They were incendiary enough to create a firestorm, yet reasonable enough that powerful figures (and masses of not-so-powerful people) rallied around him. It was a fine line to walk and Phil only got away with it because people expect him to be unfiltered. I’m not sure how much you know about Phil, but I’m certain he knew exactly what he was doing. He’s quite savvy. You’ll notice he hasn’t apologized. I’m not familiar with Justine, but it looks like she made a careless mistake. In other words, the two don’t really go together. Leave a Reply to Ryan Belcher Click here to cancel reply.